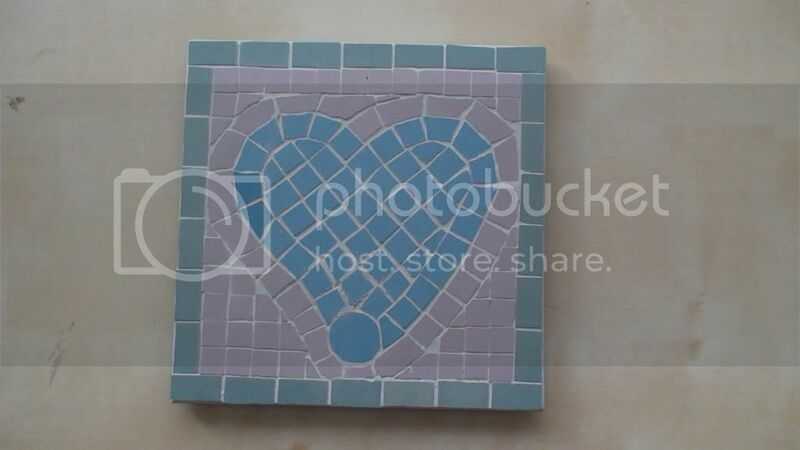 here is the first exercise- creating a heart on a wall tile. Since then we have made a tile by the "reverse" method in a mould and covered it in concrete so that the image is revealed when you release the concrete from the mould (when set) and turn it over - also similar one using clear glass tiles and attached to a sheet of glass using clear silicon adhesive, covering two 3 dimensional objects (flowerpot and polystyrene ball) and now we have just started a project of our own choosing. Very nice. It is nice when you get to do something you enjoy. I like using paper for a paper collage version of mosaic tiles from time to time, but that is as near as I have got to the real thing. I once watched a demonstrartion of multi layering coloured paper, foil etc, so that the surface was at varying thicknesses using clear glue, and once set it was cut up in to shapes to make mosaics as you have mentioned- it was very effective as it was textured as well as colourful. Her is another piece - mines the flowerpot at the bottom- more a ramdom placing of broken ceramic plates and regular mosaic tiles with a piece of ceramic that we made on the first day than a casrefully crafted mosaic! What a fun thing to do Martin. I wish we had groups of a similar nature here, it is always more enjoyable to do with other people. Yes there are 12 of us, plus the tutor and an assistant (who also makes mosaics with us in between helping) and as I am the only male, I have been made an honorary female for the duration by my smaller group. There are two rooms seperated by a doorway so we have six people in one and six in the other room. It is a bit problematical when it comes to grouting our work as there is a very small room/kitchen where three is a crowd, but it is the only place to do the grout work as there is a sink to clean up items and to turn the powder grout in to a paste. We have to work in shifts to get it done. It is a bit chaotic at times, but good fun. It wouldn't do you any good without the chaos, it would be too easy a life. It has a brownish red collar and similar coloured lead- still to be added. Just the joy of filling in the background now - Oh and cutting the shaped tiles for the words! The choice of dog was based around one found on the Isle of Capri as a warning for visitors, and is a simpler shape to the one I saw in Pompeii a few years ago, which is more complex, but not so easy to scale down in size to a 30 by 30 cm square board. I used pre-cut marble tiles, which are easy to use, but little perishers to cut to any shape- they will cut, but the resultant shape is unpredictable, so had to be creative in the layout which left a few odd gaps - I have to say it looks better in the photo, so I'm hoping it will look OK when fully finished. I'm bogged down now in running a border around the dog in my Cave Canem mosaic- the lead and words Cave Canem, are now done, but the border is very fiddly, many changes of direction to contend with. Also running out of tiles- I hope my tutor has more of this colour in stock. This is the Cave Canem work in progress. Trying to complete the outline and fill in some of the spaces, before filling in the main parts- not sure how to work around the words yet though. looks good, where are you going to put it? That's a good question- it will have to be inside as the board and adhesive are not waterproof - I am sure E will have the final say on that! One I made a while ago, a green lizard clinging to a wall (at least that's whet it's meant to be) is on the bathroom wall- nicknamed Verdi it is only A4 sized so not to obtrusive- this one is slightly squarer but again not oversized. Beautiful design. I am always truly impressed when a hobby can turn out great results. can I commision you for this?